Social media is flooded with images of teens and tweens posing with e-cigarettes puffing candy-flavored vapor, but what's in the liquid that kids are ingesting? Nicotine for one, but cannabis oil could be too, as well as other carcinogenic chemicals. "In the old days you pull out a cigarette, you'd know what it was. Someone hands you one of these devices that just has a liquid in it. You don't know what's in that and neither do we," Stowe High School Principal Chris Oleks said at a recent panel discussion on Juuling. The Juul is a brand of e-cigarettes that has seen popularity among teenagers. 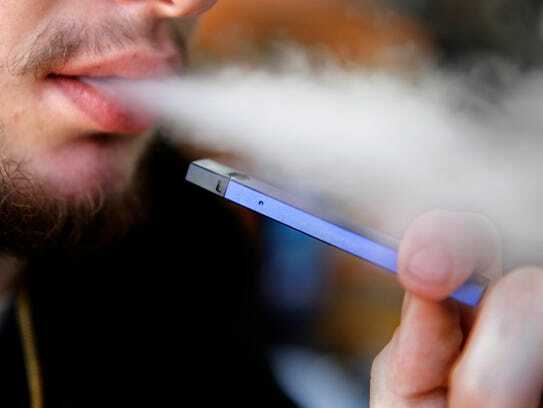 Vaping or Juuling is another name for puffing on the flavored vapor produced when an e-cigarette heats up liquid in a pod, which in most cases is refillable. THC oil is a concentrated derivative of marijuana which can be used in e-cigarette vapor pods. Oleks said because the substances in e-cigarette pods are unknown and unknowable, school policy needs to thwart dealing and distribution on school campuses with clearly stated rules and consequences. "Arm kids with information," Oleks said. Parents can start discussions at home which re-enforce what children absorb in school. "The availability and the potency of the marijuana now accessible to kids is much higher than what it used to be," Corp. Kevin Grealis said on Monday. Grealis, a police officer dedicated to youth services in South Burlington, spoke about what parents ought to know as marijuana legalization is around the corner. He said there are many marijuana products available now that kids might get their hands on, like THC infused oils and edibles. More students are trying e-cigarettes and fewer are using cigarettes, marijuana, weed or pot, according to the results of a 2017 youth survey, Vermont Department of Health announced recently. The survey questions did ask about vaping but it did not ask about blunts, Juuling, THC oil, or edible THC infused snacks. A blunt is hollowed out cigar or cigarillo refilled with weed. Smoking a blunt is one of the most popular and most unhealthy ways of smoking weed, according to High Times in January 2018. Vermont's new marijuana law only applies to adults. "First of all, it's illegal under the age of 21," Justin Hoy, director of prevention services for the Essex Westford School District said. Hoy is concerned that there is a perception of harmlessness around cannabis because of the push for legalization. Hoy and others cite research that shows brain development continues until about age 25 as a reason to keep kids and drugs apart. "It's bad. It can adversely impact the part of the brain that regulates complex decision making," Hoy said. But while scientists do agree the average human brain is still developing throughout a person's early 20s, the relationship between the development of the brain and marijuana use is still being studied, according to the National Institute of Health. The earlier young people use marijuana and alcohol the more likely they are to have a substance abuse issue, according to the National Institute on Drug Abuse. Contributing factors may be family history of drug or alcohol abuse; and, doing drugs can lead to seeking the company of peers who are abusing drugs. There's vaping and there's smoking a blunt, and according to the DEA there are hundreds of names for marijuana -- and they are always changing. Local cliques may have their own code language. The drug nicknamed "spice" is not synthetic weed. It isn't cannabis at all. It could be any number of chemicals of an unknown potency, manufactured in labs. Kids use it "because it's cheap, easy to get hold of," according to a Vice article in 2015 called "A Guide to Spice, a Drug that's Putting Kids in Hospital. If you were thinking of smoking in front of your kids once marijuana is legalized, consider this: one minute of exposure to second hand marijuana smoke in rats caused longer-term harm than the same exposure to tobacco smoke, according to a 2016 study published the Journal of the American Heart Association. It will be illegal to smoke marijuana with a child under 18 in a car in Vermont, according to the new state law. The person using marijuana could face a fine of up to $500 for a first offense, and more for subsequent offenses. That person could also get two points on his or her license. Some studies have shown an association between marijuana use and car crashes exists. And studies have shown that weed negatively affects the skills used to drive safely, according to the Center for Disease Control. But the CDC states it's still impossible to prove marijuana increases the risk of a crash because there are no accurate roadside tests and THC can stay in the users' system for days or weeks. A Vermont bill that would let police use a roadside saliva test to detect marijuana and other drugs was rejected by a key Senate committee. "You don't have a connection, a nexus between what the result of your test was and whether you were actually under the influence," said Sen. Joe Benning, R-Caledonia, a member of the Senate Judiciary Committee who is also a criminal defense attorney. JUULing — puffing on the trendy e-cigarette that can easily be mistaken for a USB — is nothing new. But over the last year, JUULs have become ubiquitous on high school and college campuses. E-cigarettes, those small pen-like devices that heat up a liquid vapor to be inhaled are also know as vape pens, Juuls and other names. "The researchers conclude that just as with traditional cigarettes, messaging to teens must include warnings about the potential risk of toxic exposure to carcinogenic compounds when using these products," a study published in Pediatrics in March states. Those fun fruit flavors that teens love have a price beyond possible nicotine addiction. E-cigarette fruit-flavored products produce high levels of acrylonitrile, a chemical used to make plastics, which is a known carcinogen.